Please DO NOT sit bags of trash at the curb. All trash should be deposited in the proper receptacle on Seaview Ave., Flatlands 9 St. or at the bottom of either ramp on E. 108th St. Please refrain from sitting bags of trash in the public hallway outside of your apartment door. This detracts from the décor and offensive to your neighbors. Rinse beverage cartons, bottles, cans, and foil clean of food and residue. This little effort makes a world of difference. Place regular garbage in designated recycling containers. Separate recyclables from regular garbage and place them in the proper containers provided by building management. Breaak down boxes before placing them in the white bin. NOTE: We received three violations from the City in recent months because recycling materials were mixed in with the regular trash and vice versa. Recycling violations carry fines of $25 (first Notice), $50 (second Notice), $100 (third Notice), and $500 (four or more Notices within a six-month period). Note: According to the Department of Sanitation, buildings with 10 or more apartments that receive four or more Notices of Violation within a six-month period will be fined $500 for each bag that violates recycling regulations, up to a maximum of 20 bags within a 24-hour period. This translates to a maximum fine of $10,000 per day. Failure to remove garbage and non-recyclables from designated recycling containers. Failure to flatten and tie corrugated cardboard boxes (unless broken down into small pieces and placed in a bag, container, or dumpster). Failure to tie newspapers, magazines, catalogs, and phone books into bundles no more than eighteen (18″) inches high (if not placed in a bag or container). Placing mixed paper, newspapers, magazines, catalogs, and phone books in any bag other than a 13-55 gallon clear plastic bag. Placing beverage cartons, bottles, cans, or foil in regular garbage. Using recycling containers or blue recycling bags for regular garbage. Using an improper recycling container or failing to provide appropriate containers. Placing separated recyclables out for collection in regular garbage containers. Naturally, during the warm weather months, the opportunit to enjoy your terraces increases however, please be mindful of various safety considerations. Barbecuing or otherwise cooking on your terrace is a violation of Fire Department regulations and the By-Laws of the Condominium, page #342, as stated in the condominium offering plan. For these reasons, there should not be any barbecue grills on anyone’s terrace nor should the terrace be used to store bicycles, toys, car tires or other items. The By-Laws also prohibits the drying of clothes on the terraces. Under no circumstances should there be any items attached to the terrace rails or to the brick wall (including Satellite dishes). Please watch your children when they’re on the terrace to make sure that they do not throw objects that can injure passersby. With the warmer weather, music often seems to move beyond the confines of the apartments and out of open windows. With the help of portable stereos, the music travels into the public areas of the property. Drivers, please keep this in mind when parking your car in the parking areas (especially at night). Playing music at excessively loud levels is inconsiderate and it is also a violation of the Rules & Regulations contained in the By-Laws of the Condominium. The congregating of groups of people in common areas of the property is not allowed. Such activity can be disturbing and unnerving for other residents. This includes the building vestibules as well as the Health Club. Please keep in mind that there are studio apartments immediately on the walkways. It is offensive to all owners/tenants to have to listen to people talking loudly and using foul language. 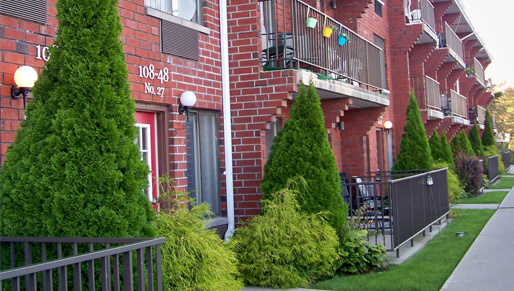 The walkways in front of each building, the hallways and the stairs may only be used to enter and exit your apartment. Children should not be playing, riding bicycles and scooters or throwing balls against the wall in these areas. Please use the same courtesy when sitting on the benches near the tennis court and swimming pool. THESE SITTING AREAS CLOSE WHEN THE SUN GOES DOWN. The hallways may not be used as a storage area for items that do not fit inside of your apartment or that you do not want to carry upstairs or for shoes. If you have items in the hallway, you must bring it into your apartment. Management will remove and discard any items found in the hallway (including under the staircase). The pool will be opening soon. The pool may only be used by owners/tenants. However, guest passes will be issued for a two day period each time. To obtain a pass for the pool, please bring a current photograph of each family member who will utilize the people. No group photos! Please write the full name and apartment number on the back of each photo. POOL PASSES WILL ONLY BE ISSUED TO THOSE FAMILIES WHO ARE IN GOOD STANDING. Please be reminded that CHILDREN UNDER THE AGE OF 18 ARE NOT ALLOWED IN THE HEALTH CLUB. If they must use the restroom while using the pool, they must go home to their apartment. THERE ARE NO EXCEPTIONS TO THIS RULE. If you have any questions regarding this or any other matter, please contact the Management Office at 212-302-5544. The following rules and regulations have been designed to accommodate the needs of all members and to help ensure an atmosphere of safety, relaxation and enjoyment. Your cooperation and adherence to these guidelines will be greatly appreciated. 2. Children under the age of 14 must be accompanied by an adult. There will be no exceptions. THE LIFEGUARD IS NOT A BABYSITTER! 3. Membership is not transferable. Residents must show pool pass ID upon entering the pool area. Passes should be requested with sufficient time to be processed. 4. No eating or drinking of alcohol on the pool deck at any time. 5. Use of the pool when the lifeguard is not on duty is strictly forbidden. 6. Lifeguards and Management have full authority to suspend or revoke membership for any violation of pool regulations, conduct deemed objectionable or compromising the enjoyment of other members. 7. Before entering the pool, bathers must observe sanitary regulations as required by New York City health code regulations. 8. Dogs and other pets are prohibited. 9. Residents using the pool do so at their own risk. 10. No glassware of any kind may be brought into the pool area. 11. Management reserves the right to close all or part of the pool facilities due to inclement weather, mechanical failures, etc. The pool will be closed when it’s raining. 12. Management reserves the right to limit the number of guest passes daily to two per household. Passes can be picked up from the Management office. 13. No entering the facility with illegal substances. Anyone caught will be prosecuted to the full extent of the law. 14. Everyone wishing to swim must wear proper swim attire. Absolutely no cutoffs, T-Shirts, underwear. 15. No running on the pool deck. 16. NO DIVING into the pool! These rules and regulations are subject to change without prior notice at the discretion of Management.